Earlier, the most economical and easy method of fixing the problem of a missing tooth, tooth decay, or any kind of tooth injury was to get dental bridges or dentures. The process of getting Dental Implants via tooth dentures was to grind the neighboring natural teeth as well in order to fix the decaying one. With the continuous advancement of the dental industry, cosmetic dental implants helped serve this purpose to a great extent. It replaced the conventional methods of getting bridges and dentures for teeth. We, at North Island Dental Arts, take your tooth problems seriously and believe that your smile is connected to your confidence and we provide the best dental services to serve this purpose. Our experienced and well-trained faculty treats patients like family. Our primary focus is to provide you with the best dental care services. A cosmetic dental implant can be defined as a substitute for the root of a tooth. It is mostly used in order to replace a decaying or missing tooth and bring back that natural smile. 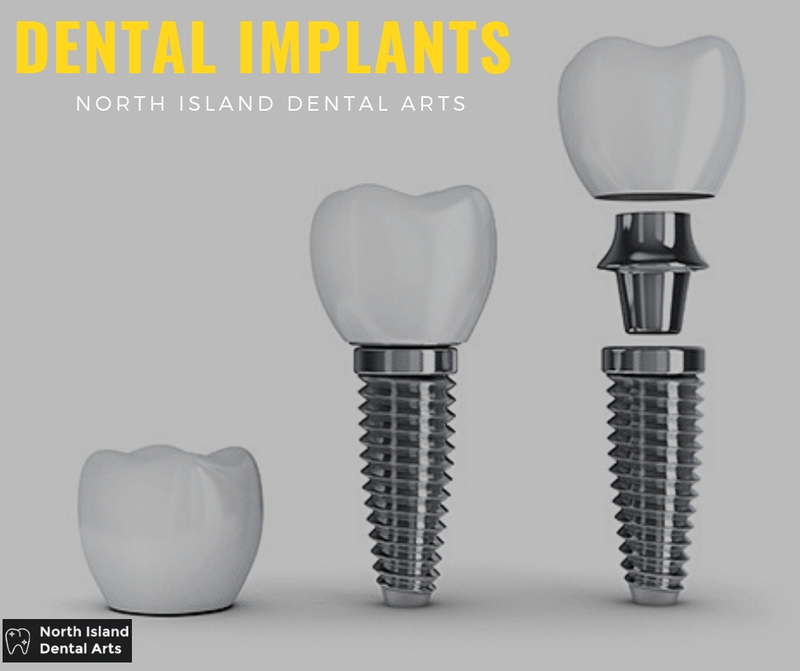 Dental implants are made in accordance with the natural teeth. Dental implants get easily fixed with the jawbone and provide lasting support to artificial teeth. The major advantage of getting cosmetic dental implants is that the neighboring teeth do not need to be ground as in the case of bridges and dentures. Dental implants are more comfortable in comparison to bridges and dentures. These are mostly used to secure dental crowns and dentures and prevent them from losing the place and sagging. Cosmetic dental implants are made up of materials that are in accordance with the body. These are made up of titanium which is lightweight but strong. What is the procedure of getting cosmetic dental implants? Consultation with the dentist: A person must consult a dental implants dentist in order to get the cosmetic dental surgery done. The dentist will make a post-surgery analysis and recommend the best treatment. An X-Ray of the mouth will be analyzed by the dentist and an impression of the teeth will be taken. Bone grafting and tooth removal: The next step in the process is to get a bone graft done. The process of bone grafting involves trimming of the bone connected to the teeth in order to make space for the implant. Bone grafts can take 4-12 months to heal properly. The process of dental implants can be resumed once the graft is completely healed. Next step is to remove the decaying or damaged teeth. Placing the implant: After the tooth has been removed, it’s time to place the tooth implant. The process of placing a dental implant can take up to 1-2 hours. The healing process can take up to 6 months. After the mouth has healed completely, you will be ready to get a temporary crown placed. Placement of crown: Once the implant has completely diffused with the jawbone, A temporary crown is placed to provide support to the implant. The dentist will install a healing collar on the head of the implant. The crown helps the gum tissue in healing properly. New tooth attachment: After the placement of the crown and complete healing of the mouth, the next step is to attach the new tooth to the implant. The dentist will take an impression of the mouth and get the artificial tooth custom made. These artificial teeth require the same routine cleaning and care as the natural teeth. Post surgery checkups: It is recommended to maintain good hygiene to keep the implants healthy and in place. Visit your dental implants Long Island dentist regularly to keep a check on the health of your cosmetic dental implants.